Annuals offer an almost infinite variety of flower color and plant form. They brighten landscape beds and add a splash of color to a porch, deck, or patio when placed in containers (Figure 1). Some also make good cut flowers (Table 1). In Florida, most annuals only last one season (not one year). To be successful, they must be planted at the right time, but unfortunately they are sometimes sold out of season and are therefore short-lived in the garden. Typically, annuals are divided into two types: warm season and cool season. 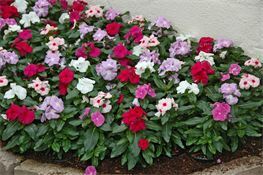 Warm-season (tender) annuals are able to take the high levels of humidity in south Florida during the summer months as well as the blistering heat. Warm season annuals include: Celosia, Coleus, Guzmania, Torenia, Portulaca, Melampodium, Caladium, Zinnea, Verbena, Vinca and Wishbone flower. New Guinea Impatiens are a cool season staple in South Florida. Cool-season (hardy) annuals are intolerant of heat, rainfall, and humidity. They are planted in fall and usually expire with the onset of summer. 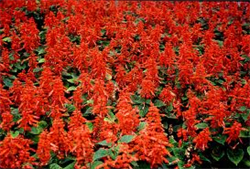 Cool season annuals include: New Guinea Impatiens, Marigolds, Begonias, Salvias, Snap Dragons, Geraniums, Alyssum, Lobelia, and Petunias. Before shopping for annuals, determine how much sunlight the plants will receive. Some annuals tolerate full sun all day; others do best with just morning or filtered sun. Remember that in summer the sun is directly overhead, while in winter the sun is in the southern sky and may be blocked by trees or buildings. 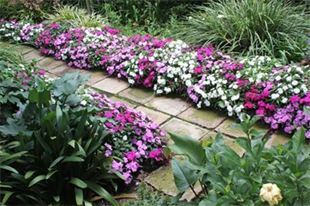 No annuals perform well under heavy shade. Garden centers today offer a wide assortment of annuals in various sizes, from cell packs to 1-gallon pots. The size you purchase depends on your budget, patience, and the landscape impact you desire. Larger plants provide instant effect and may be easier to establish than smaller plants. Choose compact plants with healthy, unblemished leaves, good green color, and lots of flower buds. It is not necessary that they be in bloom at the time of purchase. Growing annuals from seed requires time, water, fertilizer, and weeding. Plants often begin to flower about the time they should be removed. See Germinating Your Own Bedding Plants for the Florida Landscape (http://edis.ifas.ufl.edu/ep013) for more information. Annuals serve as an accent to the landscape, not a dominant feature. They should harmonize with the setting and the color of your home. Combinations of many flower colors and plant forms are appropriate for a “cottage garden” look, but attractive flower beds can also be achieved by using just one or two types. Color should be used to direct the eye. For example, a colorful flower bed along a walkway to your home visually pulls a visitor to the front door. Good preparation of the flower bed is another key to success (Figure 4). First, add 2–3 inches of organic matter, such as compost, peat, or potting soil, to the soil surface. Next, sprinkle a controlled-release fertilizer such as Osmocote, Dynamite, or other similar product at the rate indicated on the label. Thoroughly mix it into the top 6 inches of soil. Organic matter helps the soil retain moisture, and controlled-release fertilizer provides a continuous nutrient supply over an extended period of time. Product labels normally specify the time span that the fertilizer will be released (e.g., 3–4 months). Choose a release time suited to the life span of the annual(s) you plant. Water the annuals well before and after planting. Spacing of plants should be based on the mature size of the plant. Hand-water newly planted annuals until their root systems are established. The frequency depends on the site (soil and sunlight) and the time of year. Thereafter, keep a close eye on the plants and water as needed. 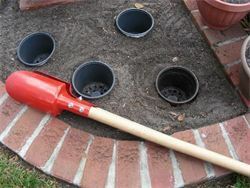 Use a post-hole digger to dig holes and then plant an empty pot. This works well in areas where soils are extremely poor, difficult to cultivate, infested with nematodes, or where tree roots would outcompete the annuals. Pot-in-pot plants may need more frequent watering, but this can be efficiently accomplished by installing a micro-irrigation system that drips directly into each pot. Fertilizer can also be precisely applied to the pot rather than the entire bed, and mulch and herbicide barriers are not disturbed.Cold-tender annuals can be lifted and moved to a protected location during short-term frost or freeze events. Overall, the pot-in-pot method allows you to have year-round color with less work. Water applied by an overhead sprinkler system can destroy the beauty of a flower bed by physically damaging the fragile petals or by causing the blooms to rot. The flowers of geranium, celosia, marigold, gerbera, verbena, petunia, phlox, portulaca, snapdragon, strawflower, and pentas are easily damaged by overhead irrigation. Begonia, pansy, coleus, caladium, impatiens, and New Guinea impatiens are more tolerant. Bedding plants are best watered with a handheld hose or with a micro-irrigation system. Both allow water to be directed to the soil and roots without wetting the flowers. Weeds can be suppressed by mulching, using pre-emergent herbicides, and/or hand weeding. Mulches should be weed free and applied deeply enough to smother weed seeds or seedlings. Of course, weed seeds can blow or wash in on top of mulch and germinate. The amount of mulch to apply depends on the texture and density of the mulch. Compost and many wood and bark mulches are composed of fine particles and should not be applied any deeper than 2–3 inches (after settling). Excessive amounts of these fine-textured mulches around shallow-rooted plants can suffocate their roots, causing chlorosis and poor growth. Mulches composed solely of shredded leaves, small leaves (oak leaves), or grass clippings should never exceed a 2-inch depth. These materials have flat surfaces and tend to mat together, restricting water and air to plant roots. Mulching materials should not come in contact with plant stems. The high moisture environment created by mulch increases the chances of stem rot, which can result in plant death. Pre-emergent herbicides can be very effective in managing weeds in flower beds. In most cases, they should be applied after the annuals are planted and mulched. Pre-emergent herbicides act by inhibiting the normal root development of small weeds before they emerge from the soil. Because most weed seeds germinate within the upper ½ inch of soil, surface-applied herbicides control them without injuring the deeper roots of annuals. To reduce the chance of damage, always check the label of an herbicide to see if it is registered for use on the annual(s) you are growing. If the annual does not appear on the herbicide label, it is illegal to use the herbicide on that plant even though you assume all risks and liabilities. Hand weeding is labor intensive, but it is a good option when herbicides can’t be used or won’t control certain weeds. Hoeing is also effective but can damage plant roots and expose dorMant weed seeds to light, causing them to germinate. Make sure that annuals receive nutrients throughout their growing season. Controlled-release fertilizers provide an extended, steady supply of nutrients. Fertilizers that are not controlled release should be applied monthly according to the label’s directions. Many annuals perform best when they are pinched and deadheaded. Pinching is just light pruning of stem tips to control the size and shape of the plant. Deadheading is the removal of spent blooms to improve appearance and redirect plant energy into new growth and flowers rather than seed production. Annuals sometimes have insect and disease problems that must be quickly recognized and managed. Monitor annuals frequently for insects and diseases. Infestations detected in the early stages can be controlled by spot treatments before the entire flower bed is infested. An insect infestation on a few plants can be controlled by picking insects off by hand or, in the case of disease, by removing infected leaves. For severe infestations, chemical control is needed. Contact your county’s Extension office for recommendations on the selection and application of pesticides (http://solutionsforyourlife.ufl.edu/map/). Root parasites, called nematodes, cause serious injury to some annuals. For more information, including lists of annuals that are susceptible to or tolerant of nematodes, see Nematode Management for Bedding Plants (http://edis.ifas.ufl.edu/in470). 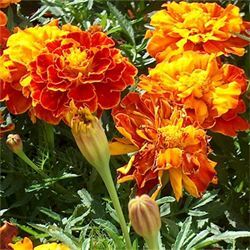 Plant annuals at the appropriate time of the year (i.e., cool-season annuals in the fall, winter, and early spring; warm-season annuals in the spring and summer). Match the growing requirements (light and moisture) of annuals to the planting site (right plant/right place). Keep plants growing vigorously by watering and fertilizing as needed. Don’t let plants wilt frequently since water-stressed plants shed their flowers and are more susceptible to infestation by thrips and spider mites. Reduce the chance of fungal diseases by keeping plant foliage as dry as possible. Use drip irrigation in flower beds and allow ample spacing between plants to encourage good air circulation and drying of foliage. Remove weeds from flower beds since weeds frequently host insects and/or disease organisms.